SecuROM 7.34 DRM disc check (later copies). By default, the game is capped at 1920x1080 resolution and adds black bars for aspect ratios other than 16:9. 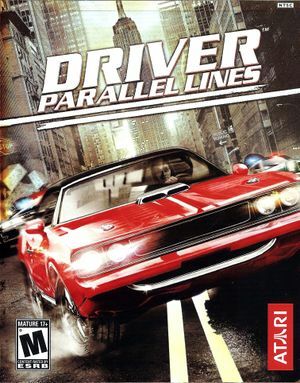 Install Driver Parallel Lines Widescreen Fix. Create wndmode.ini in the installation folder. 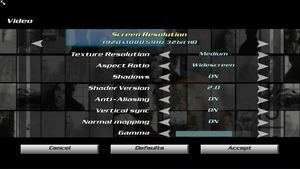 Native XInput controller support. Set in options. Entering a profile name requires a keyboard. 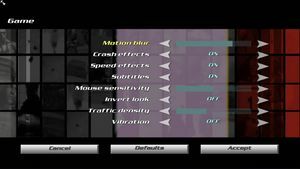 Decrease motion blur in the game options. 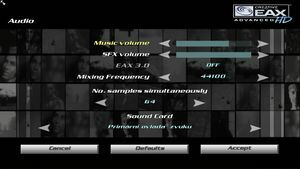 Copy the files to <path-to-game>\Music\. Renames the vehicles to what could be found in earlier versions of the game. Copy the files to <path-to-game>\Text\. Fixes spelling of various items on the car customization menus. Download English garage text and weapon names. Copy the files to <path-to-game>\GUI\. Copy Moods\ to the installation folder. ↑ 1.0 1.1 File/folder structure within this directory reflects the path(s) listed for Windows and/or Steam game data (use Wine regedit to access Windows registry paths). Games with Steam Cloud support may store data in ~/.steam/steam/userdata/<user-id>/21780/ in addition to or instead of this directory. The app ID (21780) may differ in some cases. Treat backslashes as forward slashes. See the glossary page for details. This page was last edited on 20 April 2019, at 06:17.